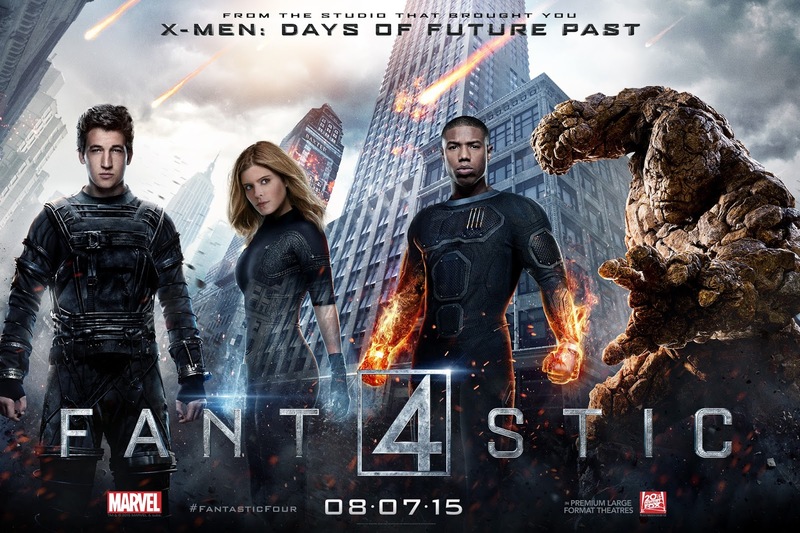 Currently the movie rights to The Fantastic Four belong to Fox. They have so far made three films based on this property, but have yet to have a success on the level of certain other superhero movies, namely Marvel's Cinematic Universe, Warner's Dark Knight Trilogy and Man of Steel, and their own X-Men franchise. Many have argued that the only way for us to get a truly great Fantastic Four movie would be to give the rights back to Marvel and make the characters part of their cinematic Universe. I don't think this is likely to happen, but what if it did? How would these characters fit into the Marvel Cinematic Universe, and who would play them? The last Fantastic Four film was a massive flop, there's no denying it. I don't actually think it's as bad as people say it is (as I argue here) but it certainly fell short of my expectations. Rather than being disappointed (as I was), it seems many fans are actually pleased it flopped. Indeed, I think many fans were willing it to be a flop before it had even come out, mainly because they believed that if it flopped then Fox would wash their hands of the property and return it to Marvel. I think this is a foolish attitude. Why wish for a film to be bad because of the slim hope that you may get a better film somewhere down the line? It's crazy. And let's face it, are Fox really going to relinquish movie rights that allow them to use not only Mr Fantastic, Invisible Woman, Human Torch, and The Thing, but also, Dr Doom, Silver Surfer, Galactus, Mole Man, and presumably Annihilus, Diablo, Dragon man, the Mad Thinker, the Wizard, Psycho Man, Red Ghost and his Super Apes, Franklin Richards, Valeria Richards, Nathaniel Richards, Kristoff Vernard, the Future Foundation, etc etc? It's not going to happen. Many fans have argued that if Marvel Studios do gain the rights to the FF, then they should place the characters in the 1960s and make the movie a period film. I've always been against this in principle. Fantastic Four should be about looking forward, looking to the future, pushing the boundaries of science and the imagination. But recently I've started thinking, yes all this is true, a 1960s FF film would fly in the face of what the characters stand for, but what I have to take into account is the fact that a 1960s FF film would also be pretty bloody cool. Just imagine, the year is 1961 and Reed Richards and his family are due to be the first people on the moon. But suddenly SHEILD announce that a different team are heading up instead, one led by a certain Victor Von Doom perhaps. The involvement of SHEILD allows for a cameo appearance by Peggy Carter (Hayley Atwell) and Howard Stark (Dominic Cooper/John Slattery). Reed and his girlfriend Sue, her brother Johnny, and Reed's best friend Ben, steal the rocket but of course, everything goes wrong. Maybe Reed's rocket could have been made by technology derived from the Tesseract (see Captain America: The First Avenger and Avengers). This alien technology could react badly with the cosmic rays it encounters in space and result in our heroes gaining their powers. Over the course of a trilogy that takes us up to the '70s our heroes could battle Dr Doom, Annihilus (leading an invasion from the Negative Zone), and of course Galactus. Along the way they could even take on an intern, a young genius named Hank Pym (see Ant Man). The trilogy could end with the FF getting trapped in the Negative Zone, which would explain why they're not in the present day Marvel Universe. Of course, they could always escape the Zone and join the Avengers in the present day, giving us the potential for cool stuff like a Hulk/Thing battle. Or we could see Reed and Sue's kids, Franklin and Valeria, appear in the present day to form the Future Foundation. Not only is Colin Salmon the best James Bond we never had, but I believe he has that sharp yet warm patriarchal vibe required to make a good Reed Richards. One of Arrow's few flaws is the way it's underused Salmon and his character. Her gloriously OTT performance as Fish Mooney in Gotham has made Smith one of my favourite Hollywood actresses. I think she's adept at action, drama and comedy, and so I can't help but want her to play my favourite Marvel super-heroine. We need a good looking actor who's young, likeable and funny. Who better than Donald Glover? He famously campaigned to play Spider-Man. That ship has sailed, at least for the moment, so why not have him play the Human Torch instead? Rhames would be perfect as Ben Grimm, a rough diamond who carries anger and warmth in equal measure. Ben is the rock that holds the team together, and I believe Rhames has the charisma to play that. On a side note, a Fantastic Four played by black actors would give SHEILD's secret Hydra agents (see Captain America: Winter Soldier), a reason to try and stop them getting to the Moon. Hydra are, after all, based on Nazis. The most important thing about any new FF film made by either Fox or Marvel is that it MUST NOT, under any circumstances be based on The Incredibles. I've written about this before, but I feel so strongly about it I'm going to say it again. A lot of fans like to describe The Incredibles as "the Fantastic Four done right." Let's get something straight. The Incredibles is not "Fantastic Four done right". In fact, beyond a few superficial similarities, the Incredibles are nothing like the Fantastic Four. 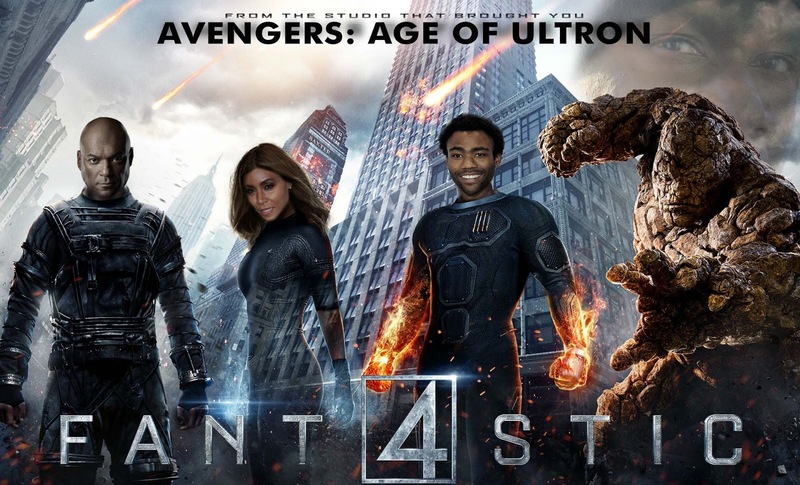 I honestly don't think a MCU Fantastic Four film is going to happen any time soon. But on the other hand, stranger things have happened. Who would have though twenty years ago we'd even be in a position to talk about the FF joining a successful and growing Marvel Cinematic Universe? Here's hoping that the next FF film will be a success, whether it's made by Fox, Marvel, or whoever! What do you think? And who would you have as Dr Doom? Empire Magazine's Batman v Superman cover: 1930s style! 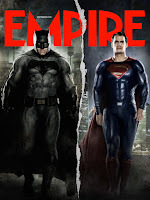 Last month's Empire Magazine featured loads of new pics from the upcoming Batman v Superman: Dawn of Justice. 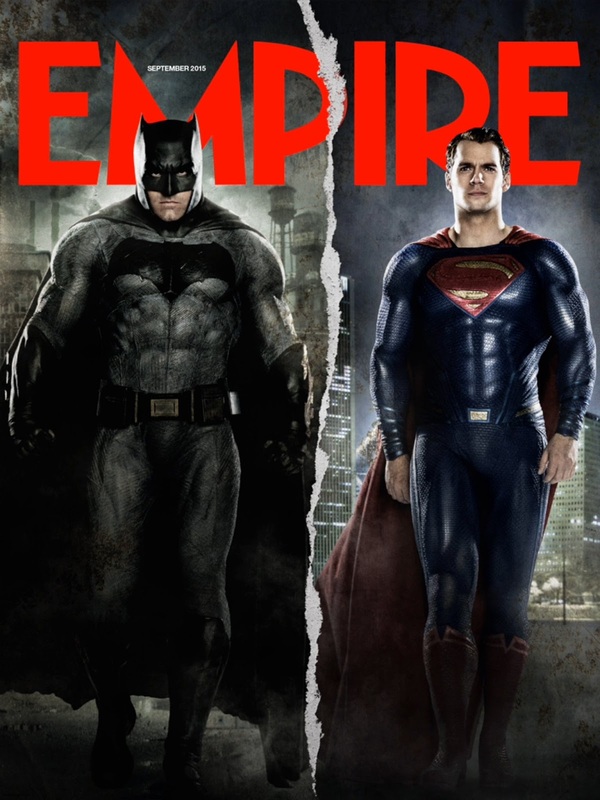 Of particular note was the brilliant cover, which featured Henry Cavill's Superman and Ben Affleck's Batman striding towards the reader. 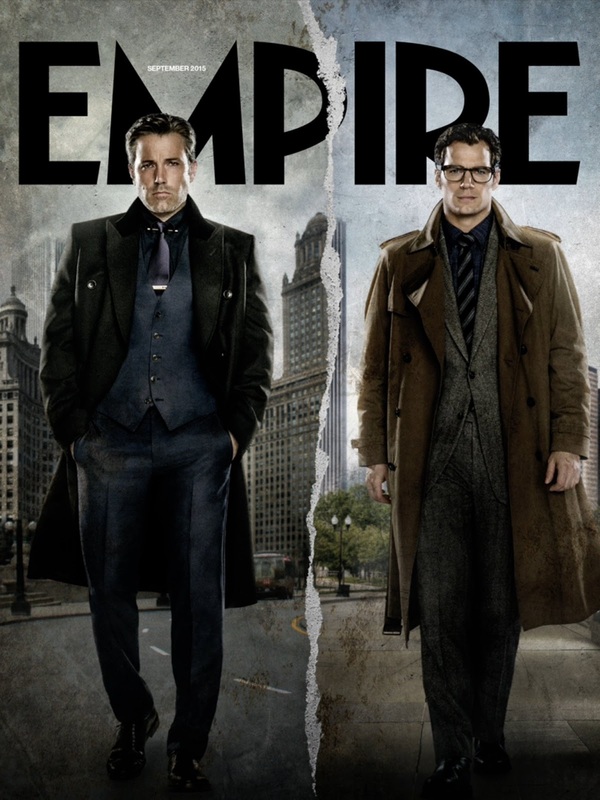 The cover also peeled back to show our heroes in their civilian guises. 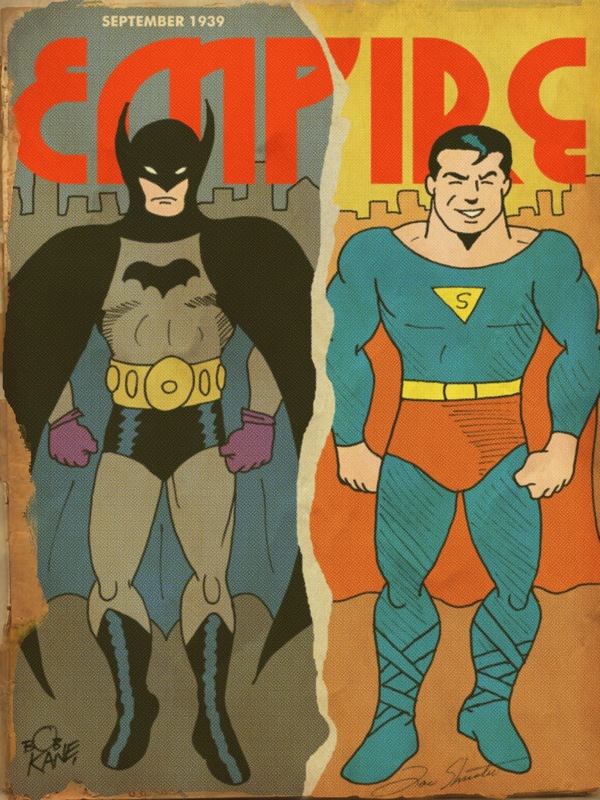 I loved it so much I decided to draw the cover in the style of Batman and Superman as they originally appeared in the '30s, when they were drawn by Bob Kane and Joe Shuster respectively. UPDATE: Now in Swiping GIF form! I've just returned from Sheffield Film & Comic Con 2015, and just like last year I had an amazing time and met some lovely Doctor Who people! 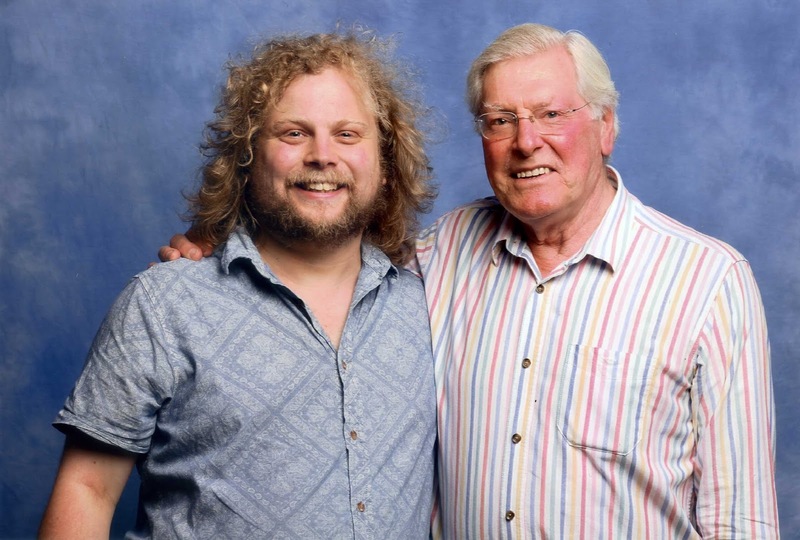 This year I met Colin Baker (my favourite Doctor), Nicola Bryant, and Peter Purves. I've met Colin and Peter before but it was no less of a thrill this time. I attended a Q&A with Colin and Peter and was able to tell them how much I enjoy their work for Big Finish. I also asked Peter what he thought William Hartnell would have made of recent Doctor Who episodes. Peter said that he thought Hartnell would not have liked New Who as, like him, he would have found it hard to follow. Colin agreed that he often found New Who's plots hard to follow, despite being a fan of complex drama such as Twin Peaks. 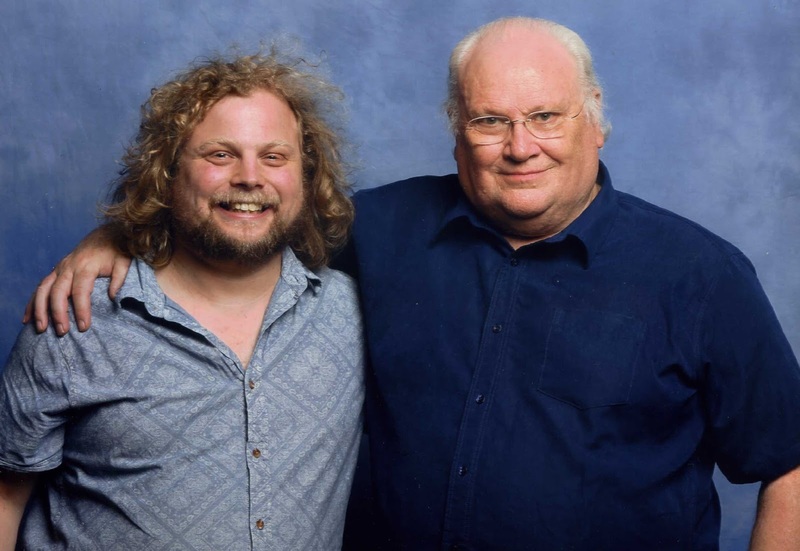 Peter added that he thought Hartnell would have liked Big Finish, and then both he and Colin spoke highly of the quality of the scripts and production of Big Finish's audio adventures. I'm inclined to agree with them on the quality of Big Finish, and although I love New Who I agree that Steven Moffat's "timey-wimey" plots can occasionally be a bit hard to swallow. 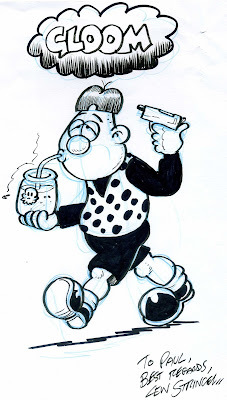 I was also lucky enough to meet one of my favourite artists, Lew Stringer, who draws for, among many other things, The Beano and Viz. 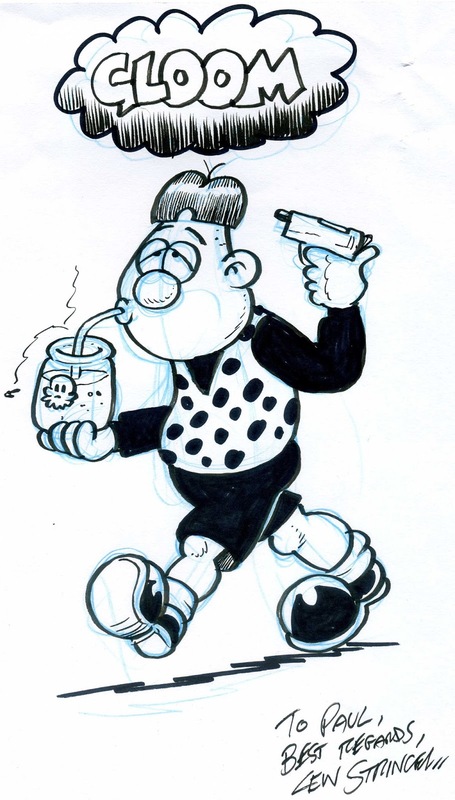 We chatted for quite a while about the perils of internet blogging, and he was kind enough to draw one of my favourite Viz characters for me, Suicidal Syd. Since Fox's most recent Fantastic Four movie was announced the knives have been out. It feels like all over the internet fans have been desperate for this movie to fail. In some cases this desire has been motivated by racism. In other cases it's because idiots think that if this film flops then the movie rights to the characters will return to Marvel. Every report of behind-the-scenes drama has been used to confirm this negativity. As a result of all this I went into this film willing it to be great. I love these characters and I loved director Josh Trank's last film, Chronicle, so I wanted this film to succeed. That's not to say that this film is the disaster that many are painting it to be, there's lots to love about it. But it's also a very flawed film, and to my eyes it seems that much of the blame for these flaws can be pinned not on Trank, but on interference from the studio. This seems especially likely if the aforementioned rumours of reshoots and behind-the-scenes strife are true. The first two-thirds of this film are brilliant. It's very much Reed Richards' story, which works well for me, since he's my favourite character out of the four. We see Reed grow up as an unappreciated boy genius, with only his best friend Ben Grimm to believe in him. Both characters are established as products of dysfunctional households who's only real family is each other. Their friendship is established so well by Miles Teller (Reed) and Jamie Bell (Ben), and the child actors who play their younger counterparts, that it almost seems a shame when Reed is whisked off to the Baxter Foundation to work on their interdimensional teleportation project. At the Baxter Foundation, Reed finds a surrogate family in Sue Storm (Kate Mara), Johnny Storm (Michael B. Jordan), their dad, Franklin Storm (Reg E. Cathey), and arrogant computer genius, Victor Von Doom (Toby Kebbell). Their family bond is established in some lovely flirty-nerd scenes between Teller and Mara, and some great father-son conflict between Cathey and Jordan. There's also a fun 'working-on-the-project' montage. The film got me invested in the characters quite nicely and made me anticipate/dread the impending disaster all the more. The cast really are excellent. Teller plays Reed Richards very well, with a nerdy, vulnerable charm, and Jordan's charisma prevents Johnny from coming across as too much of a brat. Bell is solid, stoic and loyal and Kebbell is beautifully arrogant. Mara comes across well with what little she has to work with, and that brings us to one of the film's major flaws. In the comic Sue Storm, and her (perhaps misplaced) faith in Reed is one of the main reasons that the quartet steal their rocket and head off to the stars to get transformed by cosmic rays. She motivates the cautious Ben Grimm into accompanying them by accusing him of cowardice. The decision to face the journey and it's inherent risks is very much hers. In the movie she is robbed of this choice, as she is absent when the other four (including Doom) drunkenly decide to go on an unauthorised trip to the newly discovered dimension. Reed calls on his old pal Ben, who is not a member of the project, to accompany them, but none of them think to call Sue. She only appears after their journey has been made, and gains her powers in the explosion that ensues when she helps to retrieve them from the other dimension. It might be quite in character for these young, macho, and rash men to neglect to call Sue, but the slight is never addressed in the film. 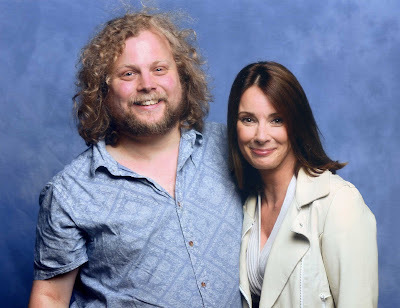 It seems to me that it would have made far more sense in the context of the film for Sue to accompany them and Ben to be left behind to retrieve them, since he was not involved in the project but was familiar with Reed's early work. Ben's later resentment of Reed would have made a lot more sense if he had not actually agreed to accompany them on their mission. Sue is shown to view their powers not as a gift but as "aggressive abnormal physical conditions" so why doesn't she resent Reed more for what he did to her? Sadly this is typical of how the film treats Sue. Her description of her pattern recognition abilities and their relation to music is pretty much the only good character moment she has. Her other character moments are all about how she relates to Reed and Johnny, and after she gets her powers the film seems to lose interest in her completely and she ends up being nothing more than the provider of a big, bubble-shaped taxi for Reed and Ben. A waste of Kate Mara and a waste of Sue Storm. After the quartet gain their powers (Doom is abandoned, presumed dead, in the other dimension) the film turns into a pretty decent body-horror movie, made all the more effective by all the work the film has done in it's first half to invest us in the characters. Trank has said that he was inspired by the work of David Cronenberg. This is particularly evident in our first experience of Reed's stretchy powers. Reed seems to be in some pain and his naked limbs seem almost slimy. This emphasis on the creepier aspects of their powers is completely in keeping with the spirit of Stan Lee and Jack Kirby's early Fantastic Four comics, where even Sue's relatively harmless power is shown to freak people out. The film skips forward a year and Reed has run away to work alone on a way to get back to the other dimension (or Planet Zero, as it is now named) and find a cure. Ben has been used as a lethal weapon by the American government, with "43 confirmed kills". This may seem controversial to some, but I think it serves to add to the horror of Ben's situation. Johnny is revelling in his powers and is eager to join Ben on his missions. Sue and Franklin understand the nature of these missions a bit better and clash with Johnny as they attempt to dissuade him from going. The family that we grew to love in the first half of the film is in disarray. If the remainder of the film was the story of how this family found their way back to each other, overcoming their difficulties together, and finding the meaning to their failed project in each other, then we would have had ourselves a pretty decent film. Sadly, somebody, I suspect Fox, had other ideas, and the remainder of the film ends up being a rushed, cack-handed attempt at a traditional super-hero movie. A bunch of different scientists are sent back to Planet Zero to find a cure. Instead they find Doom. Doom has had his spacesuit molded to his body. He's also found a cape on this uninhabited, previously undiscovered planet. He's brought back to our world, where he suddenly decides that he's had a guts-full of humanity and that he's going to destroy our Universe and go and live on Planet Zero. Doom has a little speech at the start of the film about how he has no faith in humanity, but no further motive is given for his decision to destroy us other than he's mental and he fancies Sue. He's nothing more than a rampaging monster, and this seems like, once again, a waste of a good actor's talents and the waste of a good character. The Four go to Planet Zero to fight him. They inexplicably don't need space suits any more. They have a bog standard super-hero battle, kill Doom, and then return to our world where they stand heroically over a giant crater, like it wasn't all their fault in the first place. The American government then decide for some crazy reason that the kids who unleashed all this horror on the world by getting pissed and stealing an interdimensional teleporter are actually superheroes and give them a big superhero headquarters. The Four share a cheesy joke in their new digs and the film ends. It really is that stupid. From the moment Doom was retrieved I felt like I was watching a completely different film. Other than my problems with how the film handled Sue I was thoroughly enjoying it and then suddenly this clever, well crafted film with an excellent cast has a complete lobotomy. The problems with Fantastic Four can mostly be summed up in a sentence: it's a decent film about scientific exploration, family, & body horror that suddenly panics at the end & tries unsuccessfully to be The Avengers. It's not the travesty that many are making it out to be, and it deserves better than the hate it's received since day one. But it's very flawed and it's pretty heartbreaking to think that studio interference might be responsible for these flaws. Obviously I don't know the full story of what happened behind the scenes but I would be very interested in one day seeing a Special Edition/Director's Cut of this film. Maybe then we'll get the truly fantastic film I was hoping for.